The Nordman 7's are a great choice. They also have Hakkappellittas (sp?) but maybe not in the Insight's size. There's nothing inherent in RE92s that necessarily make them the best, but they've been tested to be the best known all seasons in terms of rolling resistance, at least in the Insight's stock size. My technical tire knowledge is very limited, but I believe that one of the compounds used to keep rubber pliable (and therefore able to maintain grip) at low temperatures also reduces rolling resistance. The problem with using too much of this in all seasons or summer tires is that they'd wear our far too quickly as they're too soft when warm. It simply wouldn't be acceptable to have tires that last only 5-10,000 miles. Consequently you need to take your winter tires off when it starts getting warm (let's say above 40F with any regularity) or they'll very rapidly wear out. Thanks for the info! Video made a lot of sense. Don't want to wreck my "new" Insight! Regarding tire pressure for winter tires, should I keep it at only 44 PSI sidewall max, or is 60 PSI still okay? Max sidewall is 47psi in my Nokians. I run them around 48-50. My understanding is that higher pressure is often better than lower in winter depending on the conditions and to a point. Best to get additional opinions on this. They are currently sold out pretty much everywhere that isn't charging an exorbitant amount for them, so I will have to wait for now. Fall semester of college is over, and I'm back home for the next 4 weeks on break before the spring semester begins. This means...Insight time! Reused the foam from the Civic's grille block to make an upper grille block for the Insight. This will be temporary until I build the lower grille block out of coroplast. Then I'll just use the upper grille block on extremely cold days. And yes, I know I need to touch up that front bumper. Quick question: does anyone have a link to a WAI setup for the Insight? I want to build one and have no idea where to begin yet. Last edited by mpg_numbers_guy; 12-12-2018 at 12:04 PM.. I've found that RV and camper sized dryer ducting works nicely. I can't remember if it's 2 inches or 2.5, but it fits perfectly onto the air filter box. I routed mine counterclockwise in the bay to the catalyst but I've seen others who have left their air snorkel in place and gone clockwise (around the front of the engine). 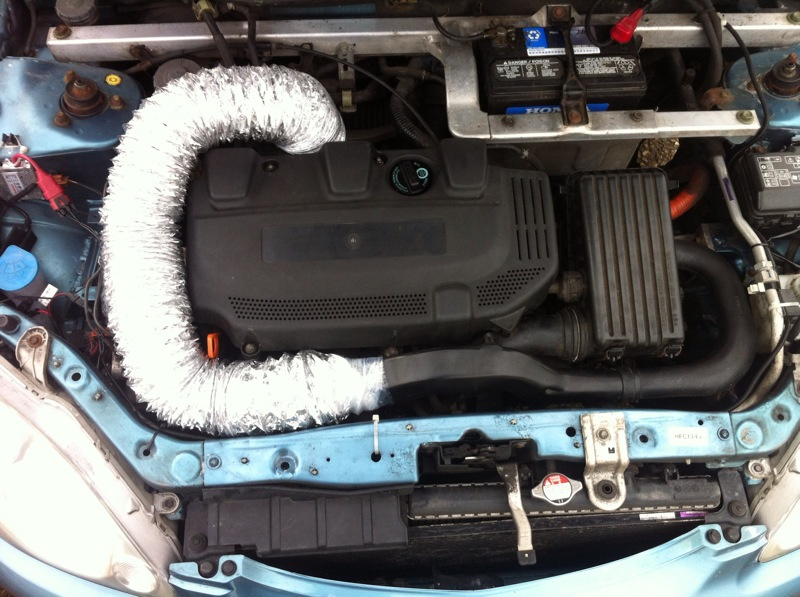 Very noobish question, I suppose, but is the air intake what I have highlighted in the attached stock photo? And isn't a WAI just ducting routing from a hot area, such as the catalytic converter? How would I capture the heat from the cat through the ducting into the intake other than just pointing the ducting at the cat and hoping hot air goes in? Last edited by mpg_numbers_guy; 12-12-2018 at 01:41 PM..
Just pointing it at the cat definitely works. The closer you get the ducting to it, the hotter the air you'll get. The example you showed works very well. You can also take that whole black snorkel off, back to the air filter box, and run your ducting from there. The purpose of the snorkel has been discussed at length on Insight Central and it's not clear if it's just for noise reduction or if it slightly levels out the torque curve, but the car runs fine with or without it. Oh, ok, so it really is that simple! Is it better to connect the ducting on the outside or inside of the intake opening? I'm guessing inside since the opening is 3" at it's widest point? Last edited by mpg_numbers_guy; 12-12-2018 at 04:57 PM..